It is estimated that less than 2% of the round diamonds sold in the UK today would qualify as "hearts and arrows" under strict grading standards. However - 100% of our Jewellery is made using this higher grade of diamonds. All of our stones come with grading reports from either the Gemological Institute of America or SureCert diamond certification. 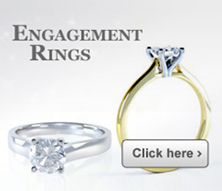 These two organizations are the "gold standard" in diamond grading and the only option for discerning customers. The Internet has changed the world. Never again will people shop for cars, hotels, airline tickets or even houses without first using the tremendous power of the Internet to educate themselves about these most important purchases. We were one of the first companies to recognise this change in the retail sector and quickly gained notoriety for offering diamonds to consumers at never-before seen discounts. By tapping into the virtual resources and global partnerships not before available, we consistently offer finely cut diamonds for hundreds to thousands of pounds less than traditional retail sources. We pride ourselves on a database of over 20,000 loose laboratory graded diamonds. We pride ourselves even more on helping each and every customer determine which of those 20,000+ diamonds is their perfect choice. . If the answer you need couldn't be found on our website, our expert staff are waiting to answer any question you might have. Most calls are answered immediately and every customer is treated like a personal friend.